book musings: What Is Your Favorite Classic Book? The Classics Club's August meme asks this question: what is your favorite classic book, and why? I had to think a bit, because, ultimately, that question is unanswerable. I have current favorites (witness my Suitable Boy lovefest), but "favorite classic" means something more, I think, something that withstands the test of time. An unhappy alternative is before you, Elizabeth. From this day you must be a stranger to one of your parents.--Your mother will never see you again if you do not marry Mr. Collins, and I will never see you again if you do. Elizabeth's courage did not fail her. She had heard nothing of Lady Catherine that spoke her awful from any extraordinary talents or miraculous virtue, and the mere stateliness of money and rank, she thought she could witness without trepidation. This is one of the few classics I've re-read multiple times over the past thirty years, and I am not much of a re-reader in general. It opened up the possibility of having genuine fun with a classic, leading me to try others on my own, on top of what was assigned at school. It comes to mind first when I think "favorite." I guess that makes it a good choice for favorite classic, right? I love Pride and Prejudice too, I must have read it three or four times now and each time I find something new about it. I notice more of Austen's wit each time, she's such a clever writer. Yes, her wit hooked me at the beginning, and I still love it, but I appreciate Elizabeth's development as a character more and more as I get older. Oooh Literary Wall of Shame - I love it! I can feel a blog post coming out of that. What else is on your LWofS? I have 6 Jane Austen books on my classics list. It's time to join the Austen love train. I think you have convinced me to start with Pride and Prejudice. It's a good one to start with. I think it's the most accessible; certainly it's the funniest. Enjoy! I also picked a book that seemed to loom in my consciousness when I was thinking over this question! This title did pop up as well. It was my first Austen, and I can't even remember how many times I've read it since that first time...Ahh, Mr. Darcy. I just love him. :) And Mr. Collins. His scenes always make me chuckle! So glad to "meet" you through the Club! I hope you're enjoying our new site! This was my very first Austen, and I read it earlier this year. While reading, all I could think was "WHY DID I WAIT SO LONG!?!?" I loved it, and can't wait to read it again and again. I did put 2 more Austen novels on my list, and I'm looking forward to that as well! Glad to meet you through the Club! Beautiful book indeed. I don't read many female author's books. I like adventurous stories more, that's why. But I remember being almost forced by a friend to read it, and at last consented to do so. And I like it. I love the father as well, since he reminds me a lot of my own. And I like the way Elizabeth speaks to Mr. Darcy. She's a smart, witty girl who isn't afraid of speaking her mind. It would be amusing to have a father like Mr. Bennet! And I do enjoy the evolution of Elizabeth's character--she's witty and intelligent, but she eventually learns not to judge based on first impressions, and not to believe everything she hears. Am I the only person on earth that hasn't read P&P? This book is probably on the top 10 list favorite classics, perhaps nr 1! I must admit I did let myself be captivated by Mr Darcy in the series with Colin Firth, but don't tell anybody! I have a new list..."promised to read and must keep the promise". This book will be on the list along with Gone With the Wind, The Odyssey, The Complete History of Jack the Ripper (when did I make this promise) and one of your favorites, Periodic Table. Also, do you have Twitter? Wonderful choice! I'm not much of a rereader but make Jane Austen an exception - her books get better every time. Exactly--I don't reread every author, but I do Austen. Yep, that first one is one of my all time favorites! Ah! The quotes you selected gave me shivers. I just re-watched the 2005 P&P last night. I adore this book. Well, it's high time, I'd say! Prepare to enjoy. 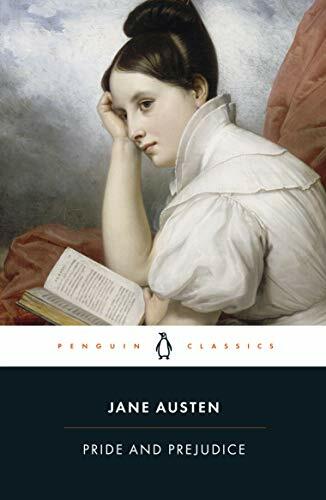 I'm in the middle of reading my first Jane Austen, Sense and Sensibility--I'm loving it and now I'm excited to read Pride and Prejudice, next. Those quotes are chilling.